Jess’ blog is your go-to resource for a local’s tips, insights and information about the Barossa, our wines, business philosophy, upcoming events - and more! Reflections on our opening weekend. It’s a rare and wonderful thing to achieve a dream. As I sit here in our Cellar Door, with the fire burning down low and the late afternoon sun coming in through the window, I know this moment is important and so I’m determined to take a few minutes to soak it all in. In all the work over the last few years, in those uncertain, challenging moments I always had an image in my mind of the day we would first put our sign out on Krondorf Road. I could see it clearly in my imagination – walking down the driveway on a clear, winter’s morning, standing our “Cellar Door 500m” sign on the side of the Road and then turning back and seeing the Kaiser Stuhl and the Barossa Ranges sitting happily behind our property. Of course, as it turns out, I went careening down the driveway at five minutes to 12 on Friday, threw the sign out and got back up to Cellar Door as fast as I could to welcome our first guests. Also, it’s now well and truly Spring now, but I think there’s a saying about the best laid (and overly romantic) plans….. So I’m taking that quiet, contemplative moment now, to reflect on everything that we’ve worked towards and the realisation of a fifteen year dream. It’s been very grounding, meeting everyone this weekend, and realising that we’re now part of a broader Barossa narrative. I’ve loved hearing the stories of our guests – some locals, some regular visitors to the Barossa who fondly recall our late neighbour Rick Glastonbury and recognised a bottle of his wine on our mantle piece, or another group who came back on Sunday because they drank all their wine on Saturday night (hi Emma!). We’ve had warm, generous feedback about the wines and the opportunity to share the story of this property a little more widely, which was the whole point of this caper in the first place. The weather's been kind, the guests have been delightful and the work has been thoroughly enjoyable, which is a good thing because I see plenty more of it in our future. In fact, I feel I have a sense of what's to come on that front as only someone can who has hand labelled 20 dozen of bottles of wine, knowing full well there is over 200 dozen left to go. Our sincere thanks to those who visited, and to those who referred them - what a compliment *that* is. We're looking forward to many weekends to come. So here's cheers to the future, and to Krondorf Creek Farm. It's going to be amazing. The Barossa is renown around the world as a foodie paradise, and with very good reason. We're spoilt for choice, with some of Australia's best restaurants and finest culinary experiences dotted across our region. But this list is a little different than you might expect. Of course we recommend that you dine at St Hugo, or Hentley Farm or Fermentasian. And don't forget a visit to the Barossa Farmers Market. But today we wanted to focus on some of the less well known food experiences the Barossa has to offer. They may not be big ticket items, but these are the tastes that bring the Barossa to life for me - the moments I'll seek out as soon as I come home from travelling to remind myself that I'm really home again. In this edition, we're looking at the wonders that come forth from the ovens of the Barossa. Stay tuned for the meat-lovers Butcher Edition! Apex Bakery - salt sticks bottom left! Apex Bakery has been firing up their Scotch oven since 1924 and is currently in the capable hands of the fourth generation of the Fechner family. Much has been written about Apex Bakery over the years - it's a true champion of the Barossa's traditional food culture, and of course you should have a pie while you're there - but for me, nothing beats their salt stick. The soft, chewy dough with just the right amount of bounce, liberally coated in crunchy, flaky salt flecks and caraway seeds is a simple thing of joy. No need for butter (although a soft cheese schmeer does up the delight factor), these are best eaten straight from the display cabinet as you stroll down town Tanunda. Allerlei is a glorious little shop in the main street of Tanunda (about one salt stick's walk from Apex Bakery). 'Allerlei' is German for "all kinds of (things)" and it really lives up to the name, with crafts, clothing, knitwear (I buy my winter socks from here every year and they're thick, woolly and so warm) and homebaked treats a'plenty, all made, baked, knitted and stitched by local women and sold to raise funds for local charity organisations. Chose from jams, chutneys, preserves, pickled vegetables and of course, cake. The recipes skew towards the Australian Women's Weekly cookbooks circa 1957 - good news for lovers of proper cake - and while the selection rotates depending on who's baking that week, you'll always find something delicious. Make sure you check out the running total on the wall of funds that have been raised through the store over the years and donated to local charities - it's heartwarming and inspiring. Super star of the Barossa Famers Market, Eleni's cinnamon scrolls are embedded in the collective consciousness of the Barossa locals and particularly Barossa Farmers Market shoppers. Eleni's Farmers Market stall is easy spot - look for the bright table cloths, beautiful wooden display cabinets and the four-deep crowd. You might need a slightly earlier start to secure your scroll, but it's so worth it. Soft, yielding dough is smothered in butter and cinnamon and sprinkled with traditional Swedish candy sugar. Surprisingly, given that description, they're not overly sweet, but have a beautiful spicy warmth from the cinnamon and the perfect dough-to-topping ratio. Best enjoyed straight from the paper bag as you wander the market, with a latte in your other hand. To many children across the Barossa, Tanunda Bakery is simply known as "the Pretzel Shop!" It's packed from morning to night with good reason - Elke and her family make an astonishing array of traditional German breads, cakes and slices, interspersed with doughnuts, filled rolls, pies.... the list goes on (and includes icecream and coffee as well). But for our family, nothing beats a buttered pretzel. The pretzels themselves are divine with a soft, mouth-filling dough, salty exterior and the perfect crunch of the little end-y bits but if you ask nicely the shop assistants will whisk away your pretzel and, for a mere ten cents, return it to you smothered in butter. If you can stop at one you have more self control than me. Of course, the Barossa has been baking for over 160 years. There is a cornucopia of baked goods to discover but we hope this list is a good place to start. Have we missed anything? Comment below and let us know what baked treat you can't go past in the Barossa. Happy eating! We get it. When you're visiting somewhere new you want to feel like a local, and our beautiful region is no different. We know there's a lot of "Experience the Barossa like a Local" type guides out there, but frankly we don't all get up in the morning and head out on a hot air balloon ride (even thought they are amazing!). We suspect that instead you want to get a sense of the real Barossa - where the locals catch up for a drink and a chat or some insider knowledge on the best place for weekend brunch. Well, we're here to help. Without further ado, here's our guide to living like an (actual) local. Hot air ballooning optional. Today the Clubhouse boasts over 1200 local members and is a great place to get a feel for the genuine sense of community that infuses the Barossa. This is where the locals go for a quick family dinner, to celebrate birthdays and milestone or enjoy a bit of friendly rivalry at the Wednesday night quiz. The menu is classic bistro fare ranging from burgers and schnitzels for the traditionalists, to Barossa Valley chorizo papparedelle and char grilled nashi pear salad and there's an excellent wine list (as you'd expect). It's an excellent choice for families, with a kid's menu and playroom and the staff are always friendly and welcoming. Our tip: the Wednesday night quiz is a bit of an institution, and Friday evening sees the famous chocolate wheel in motion with all manner of prizes. Get amongst in the front bar - you never know who you'll meet! Let's be frank. The Stockwell Hotel isn't centrally located to much (except Stockwell, population 534) but there's a reason it's a firm local favourite. This is a classic Aussie pub that has been serving its local community since 1851 and an icy cold pint on one of the wide verandas is absolutely worth the ten minute drive from Nuriootpa. With great pub meals and a family-friendly welcome, it's definitely on our list for a whistle-wetter in the Barossa. Our tip: for a classic old school carvery, book a table for Sunday lunch. Greenock is such a lovely little village, with some of the strongest community spirit you'll find in the Barossa. The Greenock is located right in the heart of this community, with a genuine country-pub welcome and an excellent wine list to compliment their bistro-style menu. They're proud supporters of local breweries, wineries and food producers and you'll meet all manner of characters hanging out in the front bar. Our tip: try their Community Pie - inspired anew every month by a Greenock local - and pair it with an ale by Western Ridge Brewing Collective. It doesn't get more local than that! Triple B FM is a bit of a Barossa institution, staffed entirely by volunteers and responsible for some of the most wildly diverse playlists you'll find in any regional radio station in the country. But perhaps the most well-loved program is the weekly Wine Show. Set your alarm for 11am on Saturday mornings and tune in to hear Ben, Dave and Virginia - plus an an assortment of local guests - ruminate on all that is Barossa grape growing and wine making. The vast knowledge and experience of the presenters makes this a highly entertaining and genuinely engaging hour of radio and a particularly great insight into the workings of our local community. Keep an ear out for Ben's eclectic music picks which punctuate the discussions. If you're thinking "not much of a tip, shopping at the local supermarket, is it?" then you've never been to the Nuriootpa ("Nuri") Foodland. More formally known as The Co-Op Fresh Foodland, this gorgeous new retail space was opening in early 2017 and is a must-visit destination for Barossa foodies looking to stock up on goodies. The Co-Op is Australia's leading retail cooperative, formed in 1944 and proudly owned by 18,100 members across our community, all of whom benefit from the $600,000 distributed back through the Barossa every year - pretty impressive numbers. Today the Co-Op Fresh Foodland is a hub for the locals, with an eye watering cheese selection, including an automatic, humidity controlled cheese room, a Barossa pantry bursting with local artisan products and a friendly, bustling cafe located in the middle of the actual supermarket - take a break from all the cheese selecting and refuel with a coffee. We could wax lyrical for quite some time about the smoked meats, the freshly baked local breads... and did we mention the cheese? but we'll let you discover that for yourself. Don't forget your reusable bags! Saturday morning at the Farmers Market - and a roast for lunch. Much has been written over the years about the Barossa Farmers Market; a must-visit destination if you're in the Barossa on a Saturday morning. Do like the locals and factor in breakfast and a coffee, and then hit the stalls to stock up on the makings of an epic, old school roast lunch. 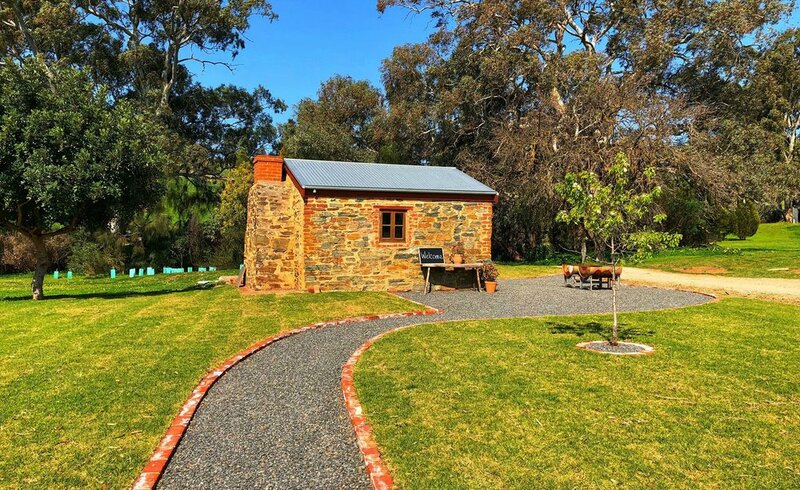 Many accommodation providers in the Barossa offer self-catering facilities and that means you can have your roast heirloom carrots and eat them too! The Barossa Farmers Market is a cornucopia of all that is special about the Barossa - great characters, real food, generous hospitality and a sense that you're part of something bigger than yourself. And don't forget the cinnamon scrolls. It's called golden hour for a reason..... On a good number of days per week, around 5pm during the winters months the Barossa is soaked in the most glorious, rich golden light. It picks up the warmth in the stonework of old buildings the region over, glints off the window panes, and turns the whole Barossa ranges an incredible hue of purple. Rug up, and take a stroll through your town of choice or pick a back road and take in the rural scenery, especially the way the light plays off the trunks of the ghost gums. It's a great way to walk off a lazy roast lunch and you never know who you'll meet. Have we missed anything? Let us know in the comments how you live like an (actual) local here in the Barossa. "All the skilful tradies, all the skilful tradies - now put your hands UP!" As tempting as it was to write this whole post in the candance of Beyonce’s mega hit All the Single Ladies, I have erred on the side of caution because I don’t want anything to distract from a very serious message: Krondorf Creek Farm would not exist today if it weren’t for the professionalism, dedication, hard work and yes, love, of our amazing array of tradies. It’s true that James’ unrelenting hard work has been the backbone - over fifteen years - of the restoration of this property but it is truly a wonderful thing to sit back and watch a master of their craft work. Wendy is a landscape architect which, we discovered, is a whole other kettle of fish than a landscape designer. She was able to stand in the middle of a barren, disproportionate patch of land and envisage a lush, beautiful and welcoming entrance to our Cellar Door. She provided a beautifully drawn, comprehensive plan and pages upon pages of plant recommendations - which underscores her true passion for plants - how and what they contribute to a landscape, a preference for beautiful natives and an understanding of the need for functionality and practicality. Thanks so much Wendy - we love our Cellar Door entrance so much! Nathan is the landscape designer responsible for turning Wendy’s wonderful plan into a reality. It’s so true that an expert is worth their weight in gold and when we stand back and look at what Nathan was able to achieve with that patch of land we’re so glad we found him. Day after day on the bobcat spent moving huge amounts of dirt around with the end result being a beautifully sculptured lawn and entrance area that drains perfectly (it’s the little things that make a big difference) and looks absolutely gorgeous. Nathan is responsible for the lush lawns, the crisp edging and the welcoming paths that bring visitors into our Cellar Door and we’re so thrilled with what he was able to achieve. As an added bonus our kids were fascinated by the bobcat and would sit and watch him work for hours, which might have put off a few blokes but Nathan took it all in his stride. Thanks so much Nathan! We simply cannot recommend Zim Masonry enough. Zimmy is the best kind of young man - hard working, diligent, proactive and dead set mad about old stone buildings. He would come to us with ideas and recommendations, took our occasional indecision completely in his stride, went above and beyond time and time again and was genuinely a delight to have around. Of all our tradies Joel and Zimmy spent by far the most time at our house and we loved having them around. Our daughter Georgia would run out each morning to show Joel all the latest scrapes and bruises on her knees and he’d share his skateboarding mishaps. There’s a lot that can go wrong when you’re bringing old stone buildings back to life. Having Zimmy and Joel on the job meant that we always felt absolutely confident that we were in excellent hands and that the situation was completely under control. You guys were the absolute best. Thank you so much. I cried the day Wolf finished building our Tasting Bar (and I’m obviously not afraid to admit it). Wolf took old timber off-cuts from a stockpile at the back of the property, old floorboards out of one of the cottages, a design sketched on the back of an envelope and a lifetime of skill and dedication and he turned it into the most beautiful, heartfelt, useful centrepiece of our Cellar Door. All the little touches on the property - the 150 year old door frames which he restored rather than replace, the gorgeous window surrounds, the internal cornices - they all show off Wolf’s deft touch and genuine care. On top of that he’s a really great bloke - softly spoken, honest to the core and a true gentleman. I still get a bit teary about the Tasting Bar and I hope that continues for many, many years to come. Thanks Wolf. If restoring the stonework of old stone cottages isn’t for the faint hearted, then putting plumbing into them takes a stout heart indeed. Andrew and Joel did a fantastic, subtle and sympathetic job and were relentlessly upbeat, even when little issues (like discovering a tonne or two of previously unknown rubble base under the floorboards) raised their pesky heads. Park of the joy in restoring this property has been to breath a new life into what were, for many, many years, abandoned buildings. Turning them into functional, useful buildings has enabled us to make a serious plan for the future of this property and we couldn’t have done that without Andrew and Joel’s help - so, thank you! Rick in particular is a man of few words but what he and Lubin can’t do with a piece of wiring isn’t worth writing home about. Much like plumbing and gas, putting electricity into these old buildings was absolutely necessary if we wanted to turn them into useful, productive buildings rather than museum pieces, and Rick and Lubin have been there the whole way. I’m particularly grateful for Rick’s quiet suggestions when I was clearly on the wrong track with some -ahem - design choices. Thank you gentlemen, for your part in bringing these buildings back to life. Our mechanic used to make some pretty pointed jokes about the state of the suspension in our cars, due to the goat track that used to be our front driveway. Thanks to Bob and his team at Lower North Hire and Civil the drive to reach our Cellar Door is now dreamlike - meter after meter of smooth, perfectly compacted road base and a sprinkling of gravel to tie it all together. And once again, the presence of some seriously heavy machinery on site for a week or so was a source of unmitigated delight for our kids. Thanks team! Finally, we would like to gratefully acknowledge the support of the South Australian Government (and by that of course, we mean our fellow taxpayers!). We were very fortunate to receive some funding through the South Australian Wine Industry Development Scheme for Cellar Door infrastructure which was administered by Primary Industries and Regions SA (PIRSA). In particular Simon Treloar was a great help to us - thank you so much for your assistance Simon!